Words are escaping me. What can I say about taking another trip to Harriman State Park only to have my drive chain crap out on me? Blow up is actually more descriptive. Somehow I sheared the chain stay right off the frame and mutilated the derailleur so that it looked like a twisted chunk of scrap metal. 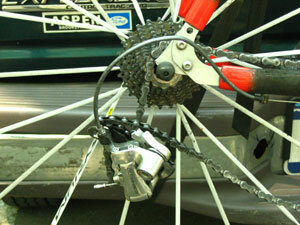 I even prepared for a chain emergency by taking an extra chain and tool, however this was something unrecoverable. The thing broke while I was climbing up Tiorati Brook Road. I was 54 miles into a 110 mile scheduled ride. Fortunately, I was riding with Todd and his friend/co-worker Sue who came up on me about 5 minutes later. He took my car key and got my car to come rescue me. While driving back to the parking lot I called my coach to find out where I should go to get it fixed. We decided it wasn’t worth going to get it repaired now and I was better off going for a run, while Todd and Sue continued their ride. Maybe it all happens for a reason. While I was on the phone with my coach, my wife called and told me she needed me home around 3pm to help prepare for my daughter’s birthday party this evening. I had no idea she wanted me home this early, which was about 3 hours earlier than I had planned. If I hadn’t shattered my derailleur, I wouldn’t have even looked at my cell phone for hours. This break therefore probably saved me from enumerable grief with my wife later on. After the phone calls, I ran for 90 minutes/11 miles while Todd and Sue did another two laps. We finished at just about the same time as each other. Todd and Sue wanted to go out for another loop, but I spoiled their party by telling them I had to go home. I really didn’t want to do it, but I couldn’t bare the guilt and grief I would get from my wife at putting my friends over her and my daughter. Deep down it was also a relief to have a legitimate reason to leave; it would have been very difficult to sit idle for another hour or so while everyone else got to ride. I think this fact made it all the harder for me to disappoint my friends and tell them we had to leave. I am not sure how I am going to handle the rest of this weekend. I’ll do my scheduled 22 mile run tomorrow; although how that will go after running 11 today will be interesting. I’ll have to get another bike in at some point during the next few days. It’s very frustrating since this was supposed to be the last big finale before I started to taper for IMLP. I was riding exceptionally well today and felt like I could have hammered out the miles all day. Perhaps this is God’s plan and this divine being is just looking out for me. This must have been the case yesterday when I did an evening run during a thunder storm. I was scared shitless that I’d be struck by lightening, but I managed to make it through unscathed. A lot of people were being looked out for last night as Prospect Park was filled with runners and cyclists despite the flashing sky. One side note I’d like to make mention of is that I was treated reasonable well when I went to R&A Cycles to get my bike repaired. I’ve had issues with this shop in the past and it was very refreshing to be treated well. Several others have said that the shop has turned over a new leaf and this appears to be so. I’ll hold final judgment off until tomorrow when I pick up my bike and see the bill, but so far it looks good.